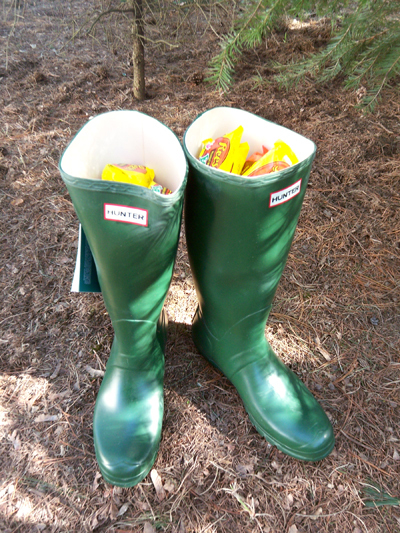 Today the Easter bunny brought Aaron an authentic pair of British Wellies filled with peanut butter eggs. 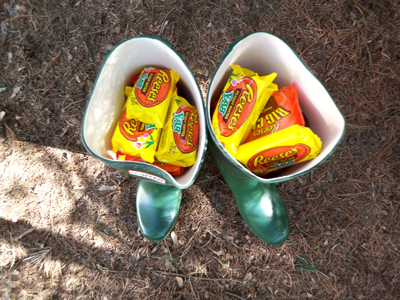 Filled from the toes to the tops with peanut butter cups and eggs. OOoooh the BIG peanut butter cups are my weakness at the moment. YUM! Suddenly I am wishing I was Aaron, we can't even buy reeses eggs here sigh. We can get wellies though lol. Nice boots! I have some too, but in black. You have invested well my friend. The big cups are my weakness, too. It's odd - I don't care for the regular sized ones but I LOVE the minis and the bigun's. So - what did the Easter Bunny bring YOU? ou have a pair yet? Before I started my animal science degree - yay Cornell! - my boss bought me a pair of "huntress" ones - the same as the hunter ones, but fitted more for women. It's a miracle those things are still in one piece, yet they see regular use in the barn! Reeces PB eggs are my food crack.